NCPA (Nariman Point Promenade) Marine Drive Babulnath Pedder Road Annie Besant Road Khan Abdul Gaffar Khan Road Bandra Worli Sea link. Timings : Track will be open only on Sundays between 6:00 Am and 10:30 – 11:00 AM. Supporters and sponsors has provision of having rented Cycles throughout the route at various locations. One can rent cycles along the tracks on hourly basis and give back at any location between the route. The flexibility of rented cycle will be a real boost as many citizen own a car or a bike, But do not have a cycle at home. 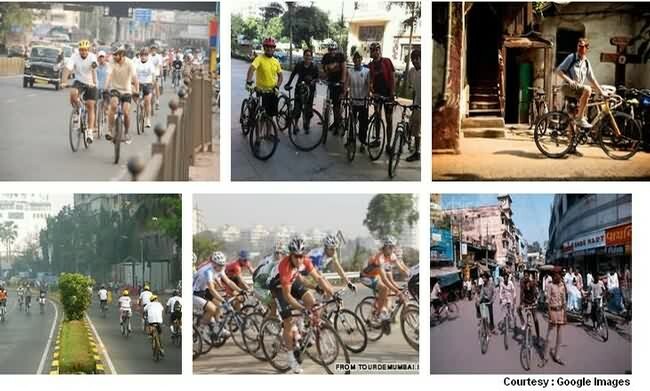 Definitely a healthy way of getting together for cycling in Mumbai. This is the very first cycling track in south Mumbai location and many such have been planned considering the feasibility of the proposed routes. By end of this month, Or possibly early 2018 another cycle track location will be open to public at eastern suburban area which has a important water supply source, The Tansa pipeline near Mulund. We will update will exact route once operational, For now the 39 Km proposed route along tansa pipeline will be between Mulund and Wadala Antop Hill, Of which initial 1.5 Km stretch will be ready before year ends. If you stay in the hustle bustle of south Mumbai with narrow lanes and all old famous commercial markets like Kalbadevi, Bhuleshwar and many other locations of Grant Road, Charni Road and Marine line residential area where parking a car is hard, forget about long drive and cycling routes, then the promenade routes can be a great choice for early morning or late nights as day times are polluted and jammed with traffic. START cycling anywhere from Charni Road, Marine Drive in East and head towards CST Fort area, cover the Colaba area, then back to Mantralaya and Nariman Point promenade, From here enjoy a uninterrupted long ride with fresh air along the sea side till Girgaum beach. Move ahead on Babulnath temple road and ahead towards Bhulabhai desai road / Pedder Road leading to Mahalakshmi Temple & Haji Ali Junction. From here turn back towards Tardeo (Right) which will take you back towards Grant Road and Charni Road area. Another cycle track for south Mumbai people is towards Alibaug area. One need to take the cycle to Mandwa Jetty and enter Alibaug to explore locations like Kihim, Kashid and Murud Janjira, all green scenic location with much better quality of Oxygen in air. Although this route is not that easy as one needs to reach the mandwa jetty first, But nothing is impossible and cycling groups do this at times for a great long drive and wonderful new experience. The rocking lifestyle locations of Andheri and Bandra do have some good locations for cycling where the route covers areas like Bandra bandstand, Pali Hill, Khar (Link road) heading to Juhu beach and Versova. Turn around from Juhu circle and head towards Lokhandwala complex that again connects the Link road at Oshiwara, Goregaon and Malad till Borivali and Gorai beach. Early morning ride to these locations will be sure fun. As said beyond Andheri, One can enjoy another suburb ride Between Goregaon and Borivali via the Link Road or early morning S V Road too. Link Road has a better ride experience from Oshiwara straight till mith chowky malad or further more towards Kandivali and Borivali till Gorai. Yeoor hills is one of the famous and awesome experience for biking. The Cycling experince at Yeoor mountains is what many people like in Thane area, More details here. Another choice for People staying between in central suburbs and thane area is Eastern Express Highway (i.e National Highway 3) that runs long between Thane and Ghatkopar about 20 km covering locations like Kapurbawdi Flyover, Viviana Mall, Korum Mall road, Eternity Mall heading towards Mulund Flyover, then connecting JVLR on right and Videsh Sanchar Nigam Limited Staff Quarters. Turn towards Ghatkopar or If you want to go further, the same road leads to a Service road which will take you to Santacruz Chembur link road. If you stay in Navi Mumbai, without any doubt the route towards Lonavala is a wonderful green experience for you cyclist group. A long 62 to 65 km ride on Mumbai Pune Old Road towards Lonavala, Khopoli Ghats. Another route one may like is towards Karnala Bird Sanctuary, about 26 km which goes via Uran phata. For Vashi people, Palm Beach road will also be a wonderful drive experience which connects Pawne Flyover towards Thane Belapur road. For long ride lovers, Far north locations on Western Express Highway (NH8) is another option. Cross the Kashi-Mira Junction and reach the Versova bridge (Bhayander Khadi), take a break at the Fountain hotel junction and decide to take right towards Ghodbundar leading Thane or straight towards Vasai Virar locations in the green towards Virar Shirshad Phata (land mark is Mahavir Dham Jain Temple). After crossing virar take Vajreshwari road that will reach Wada village at about 40 Km totally into green during monsoons where the famous Vajreshwari and Ganeshpuri temples are. Target a hot water springs if looking out for such long route. Distance from Shirshad Phata near Virar highway to wada is about 40 km. Off road trails are adventurous, Be is a walk or on cycle. Mumbai does have some beautiful trails to explore with off road experience, But one has to go some extra miles pedalling to explore the same. 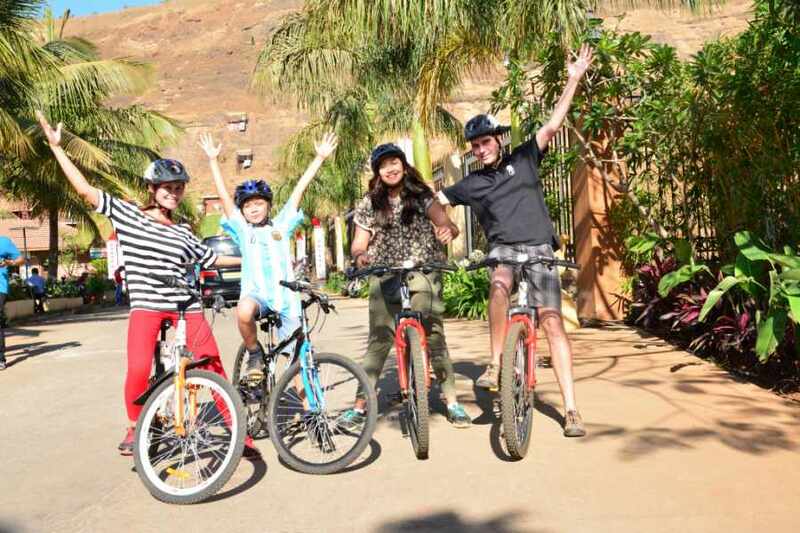 Long Distance Off Road Cycle Trails Near Mumbai : If your group has planning some long distance off road trails then Kamshet, Lonavala, Kalamboli and Kalyan locations are ideal once. Vasai virar belt is another location at far north suburbs, Few of the locations discussed below. Aarey Colony : Do not wish to extent at far off road trail locations ? Aarey is the one for you in Mumbai at Goregaon. Dense forest, lakes and long routes cycling in nature trail of Aarey milk colony is what no cycling group will like to miss. Uttan Road : Can be reached from Bhayandar by road or via Gorai by crossing the creek in a boat, Uttan is a beautiful off road cycling trail to get fresh air and feels like in some Goa village. Uttan beach is what is very famous and undoubtedly, this trail will bring one back again and again, Specially for a beautiful Sunrise point. Tungareshwar trail : Connected to National Highway near Vasai, This is one of the very beautiful off road trails in Tungareshwar National park. Know more about this location here. Pelhar Dam : Little ahead of Vasai highway and comes and Off road natural trail location, ideal for cycling adventure is Pelhar Dam located between Nalasopara and Virar (Off highway). This place is less explored and can be one of the new location for cycling enthusiasts. Vandri Lake : On same National Highway 8, After crossing Virar Shirsad at about 23 Km distance is Vandri lake. A beautiful wide lake giving a scenic view and great trail experience during Monsoon. Many cyclist already enjoyed this location. Although the distance from Mumbai goes beyond 50 Km, But monsoon’s pleasant climate and such locations gives ample reasons for cycling groups to explore such trails. Lohape Lake : If you want to go more deeper in Virar vasai area, Lohape Talao can be one more trail to your list. Little ahead of famous Vajreshwari temple near Virar Shirsad Highway is this lake, already explored by many groups. Must say, this will be a classic green experience with multiple reasons to reach and one of the main reasons being the Hot water springs around. You might also like to know about Cycling Products Shops in city and Riders Groups. Although many cyclist know about this routes, But hope many of you got some new idea and the article is helpful. Please let know your views.